A similar Military Times poll conducted in late 2016, just before Trump took office, found about 46 percent of troops had a favorable view of Trump, while 37 percent had an unfavorable opinion of the incoming president. Both polls had a margin of error around 3 percent, making the shift in popularity figures slight, if at all. “While he has done a number of things designed to appeal to the military, he hasn’t really moved the needle much,” said Peter Feaver, a White House official under former President George W. Bush who is now a political science professor at Duke University and has authored several books on military culture. Military-related policies have been central to Trump’s first year in office. His vows to boost military spending are popular, and his push to eliminate bureaucratic interference in battlefield decisions has received high marks from the troops. His pick for a secretary of defense, retired Marine Gen. Jim Mattis, has drawn widespread support. However, he’s faced some pushback on his handling of the military. It remains unclear whether he can convince Congress to go along with a big budget increase for the Pentagon. The rollout of Trump’s Afghanistan strategy has faced criticism for being too vague. His push to reverse the Obama-era policy allowing transgender troops to serve openly has been controversial. And many troops question his handling of policy related to cyber warfare and Russia. “Maybe all of his proposals are cancelling each other out,” Feaver said. Phil Carter, director of the Military, Veterans and Society Program at the Center for a New American Security, said he thinks some of the support for Trump among troops may be “wish casting” for his policies. Opinions on Trump, a controversial figure even within his own party, aren’t uniform throughout the services. Enlisted service members are much more enamored with the president than officers. Almost half of all enlisted troops who responded to the survey said they have a favorable view of Trump. Among officers, it was less than one in three. More than 53 percent of officers said they had an unfavorable view of the president. Joseph Lobban, an intelligence soldier who retired last year as a sergeant first class, said the divide isn’t surprising. For Lobban, Trump is an individual who speaks plainly and directly. “That’s why I think enlisted people respect the man, because the man is set on his position and enforces it,” he said. In contrast, one Navy lieutenant who asked to remain anonymous called Trump’s blunt talk distracting. The Trump White House “seems extremely reactionary, verging on whimsical, when it comes to matters of international politics,” the Navy lieutenant said. One retired Air Force colonel, who similarly asked for anonymity, called the officer-enlisted split shocking. “I never thought that you would have a disparity in the numbers like that,” he said. He suspects that Trump’s unpredictability is both the source of enlisted troops’ attraction to him and officers’ reservations. 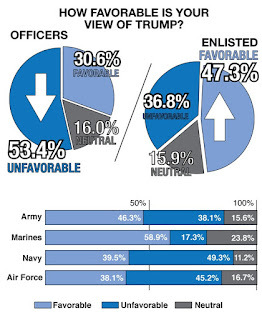 The officer-enlisted divide wasn’t the only large split revealed by the poll. Military men were much more likely to support Trump than women (47 percent favorable for men, 32 percent for women). Non-white servicemembers were much more likely to oppose the president (51 percent unfavorable) than white troops (37 percent unfavorable). Among the individual services, Trump is least popular among sailors (49 percent unfavorable) and most popular among Marines (59 percent favorable). Retired Marine Maj. Ross Schellhaas said he thinks Trump’s style may better match with stereotypes of young Marine Corps members than the other services. “I think those young people come from the more conservative regions of our nation and tend to vote that way,” said Schellhaas, an Iraq and Afghanistan vet. But Carter also said that Marines may be influenced by Trump’s cabinet. “That’s the Mattis effect,” Carter said. Mattis is arguably the president’s most well-regarded appointee, and he is especially beloved in the Marine Corps, specifically, and the military at large. More than 84 percent of troops said they had a favorable view of Mattis, a rare point of agreement among the diverse military communities. Trump’s chief of staff, retired Marine Gen. John Kelly, was less well-known among poll respondents but still had a nearly 59 percent favorable rating from troops surveyed against a 7 percent unfavorability response. Reporters Stephen Losey, Kyle Rempfer, Jeff Schogol and George Altman contributed to this story.